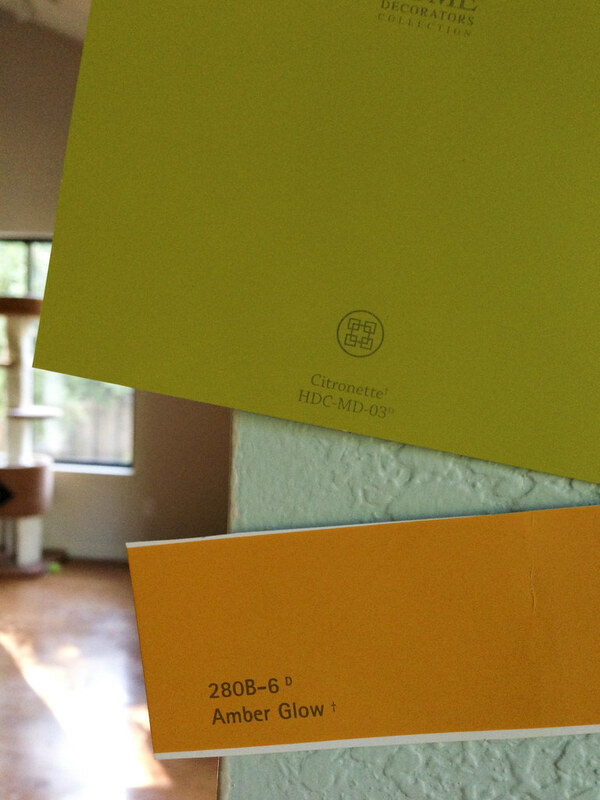 After learning more about color for Day 6’s assignment I began collecting paint chips for the entertainment room. When we first painted the room we chose a color that was so neutral it blended in with the ceiling. We decided this time around we wanted more color. Part of our challenge was to pick a color that would go well with the turquoise we’re using in the kitchen since one of the walls flows into it. 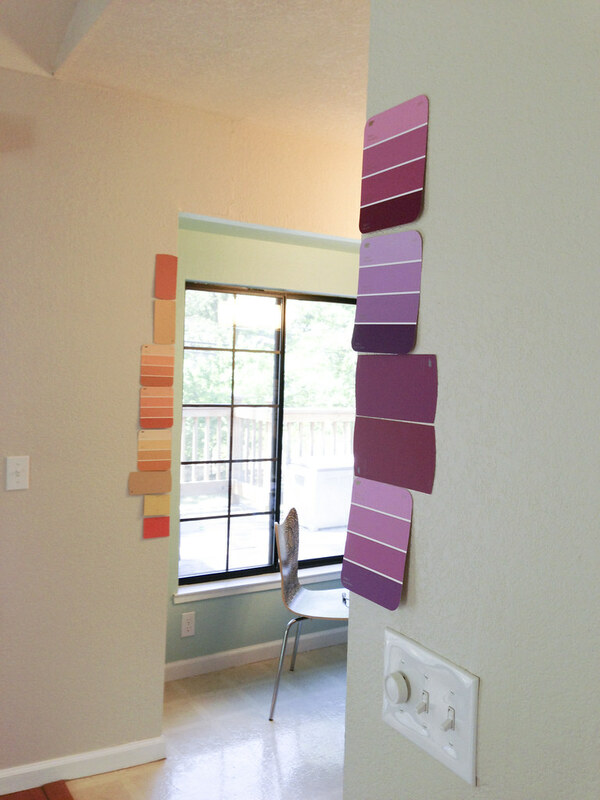 In addition to that we knew we didn’t want to paint all four walls the same color, so we had to think about two colors that would go well together and go with the kitchen. Behr had a new set of colors in their Home Decorators Collection, so I picked up some bright greens and blues just for fun. We also picked out a variety of oranges and purples. While we were able to narrow down the oranges we ended up going with a green instead of a purple as our second color. After leaving the chips up overnight to see how the different lighting looked, we chose our colors! The wall going into the kitchen and the wall parallel to that will be the orange, and the other two walls will be green. Pretty excited to see how it turns out! In between picking out potential paint colors I embarked on another project. 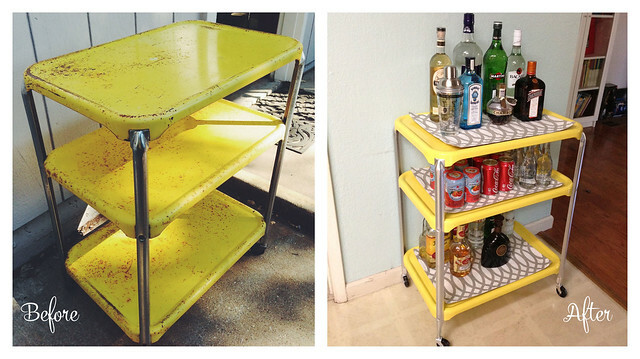 Turning an abandoned cart into a bar cart! A few visits ago to my grandpa’s house I noticed an old yellow cart collecting rust and cobwebs out on the patio. It was too scary for me to even think about touching at the time, but my mom ended up giving it a good soak with the hose and brought it home to me! 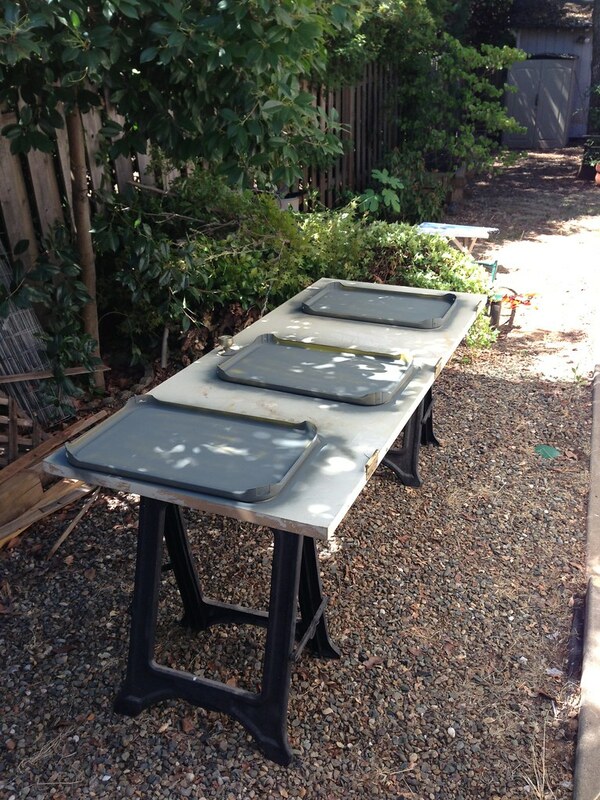 The first step was to disassemble the cart and separate the legs and trays. Next I gave each piece a good sanding with the electric sander; the legs I had to sand by hand with a sanding block on the outside and sand paper on the inside crevices. I cleaned everything with brake cleaner fluid (gotta love being married to a mechanic), and then I gave everything a coat of Rust-Oleum’s Self-Etching Primer. 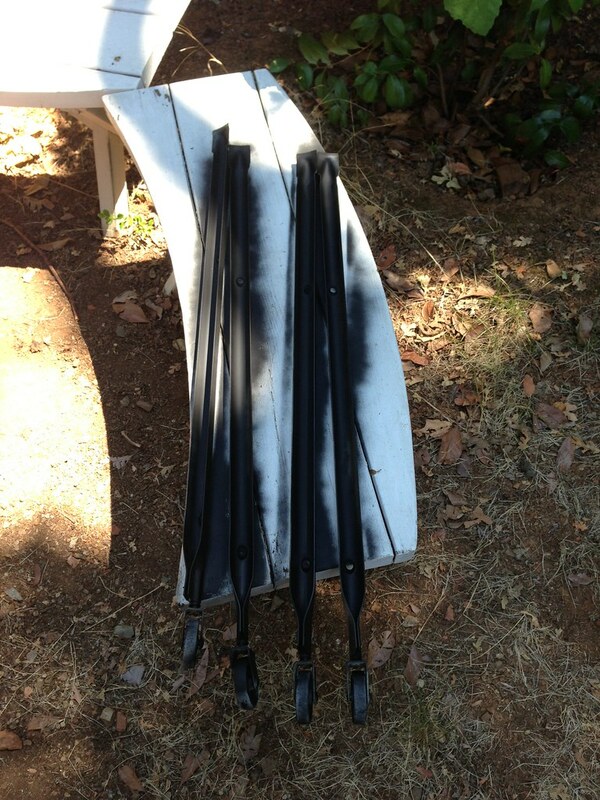 The legs were extra rusty on the inside so I sprayed them down with Rust Reformer as well. 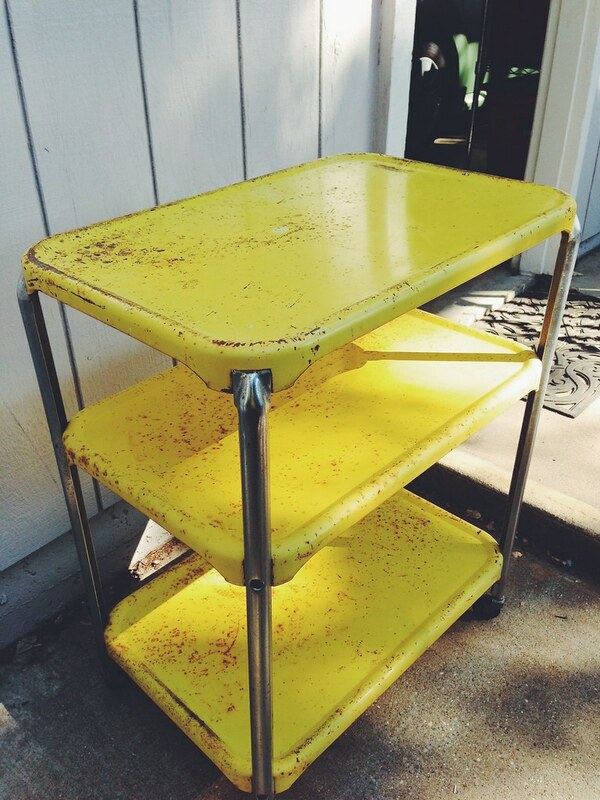 After two coats of yellow on the trays and two coats of metallic on the legs, I had myself a cute little bar cart! On the trays I laid a couple of placemats I got from ZGallerie on clearance awhile back, and then I set up my bottles! So pleased with how it turned out! 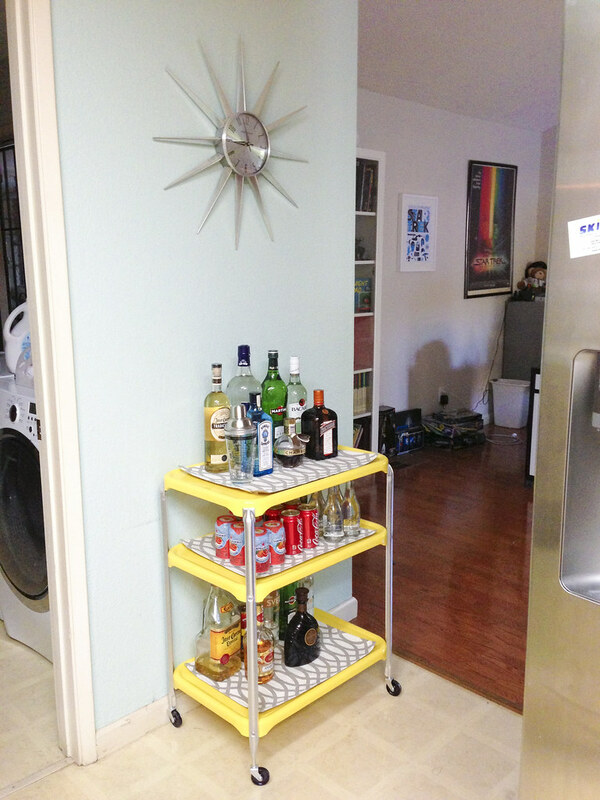 Now I need to find a spot for the garbage can since the bar cart is where it used to be. 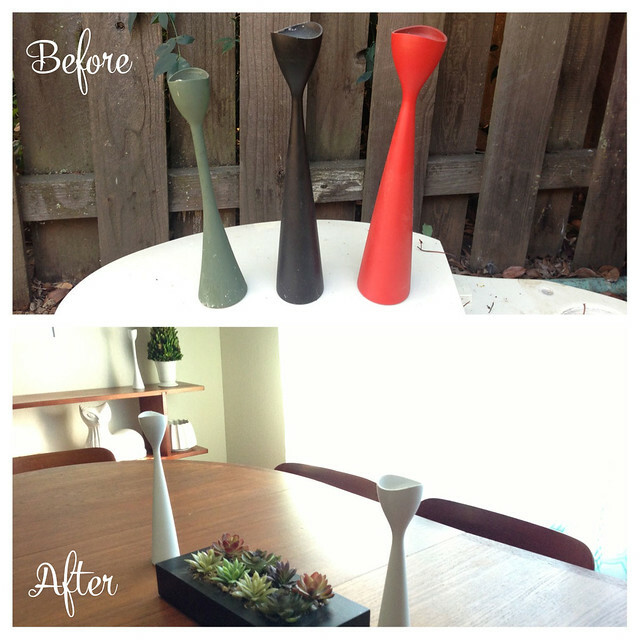 Also, here’s the before and after pics of a couple of candlestick holders I snagged from my grandpa’s house and gave a wee little facelift. I did this quick little paint job the weekend before last. The candlestick holders are by a company called BRDR Bonfils Denmark. Couldn’t find much on them, but I’m still happy to have more Scandinavian pieces to incorporate into my home! Wow! Green and orange are so bright. Brave of you to pick those 😀 Of course purple would have been just as bright. I feel so boring because all the walls in my house are the same: red on the bottom, white on the top with a black chair-rail (with the exception of the bathroom which is all red). I really don’t think I will ever want to paint my house again. It was SO much work and I seriously hate painting. LOL Good for you two.